Madeleine Thien's stunning debut novel hauntingly retells a crucial moment in history, through two unforgettable love stories. Gail Lim, a producer of radio documentaries, is haunted by the mystery of her father's Asian past. As a child, Gail's father, Matthew Lim, lived in a Malaysian village occupied by the Japanese. He and his beloved Ani wandered the jungle fringe under the terrifying shadow of war. The war shattered their families, splitting the two apart until a brief reunion years later. Matthew's profound connection to Ani and the life-changing secrets they shared cast a shadow that, later still, Matthew's wife, Clara, desperately sought to understand. Gail's journey to unravel the mystery of her parents' lives takes her to Amsterdam, where she unearths more about this mysterious other woman. But as Gail approaches the truth, Ani's story will bring Gail face-to-face, with the untold mysteries of her own life. Vivid, poignant, and written in understated yet powerful prose, CERTAINTY is a novel about the legacies of loss, the dislocations of war, and the timeless redemption afforded by love. 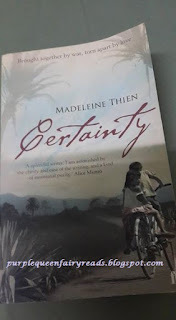 Madeleine Thien is an Asian Canadian author. I was given this book by a friend who's migrating to another contry and I kept and read this book most in my car and while waiting for traffic. It' s a rather sad book and has lots of flash back. I didn't quite like as I find the flow of the story wasn't really connecting but yet at the same time I was much intrigued by the story of Matthew and Ani. That, to me, should be the focus of the book and in my opinion, if only it was developed that way, it would have been a great book. As it is, it's only a rather good book.